The guide describes how to generate GPG2 (GnuPG 2) key pair, sign and verify commits on Linux and MacOS platforms using Git. Enter a pass phrase twice. The default key ring path on Linux is /home/$USER/.gnupg/pubring.kbx and MacOS is /Users/$USER/.gnupg/pubring.kbx . This path can be overridden by setting the environment variable $GNUPGHOME to point to a different directory. In the above example, the users long key id is ‘0xA46800C5D9A8855E’. Use the long key-id from your keys and replace with ‘<KEYID-FINGERPRINT>` in rest of the document. It’s recommended to use long key-id, since 32-bit short key-id’s are subject to collision attacks. Setup Git to sign commits and push signatures. This step updates the file ‘~/.gitconfig’ to sign commits (with your GPG2 keys) by adding the default user key fingerprint and setting the commit.gpgsign option as true. Also add push.gpgsign as true sign all pushes. Set GPG2 the default program. Upload your public key to key servers. Export the GPG2 public key and add it to Gerrit. Open the project’s Gerrit and go to project settings and gpg-keys. Copy the output from the above command, paste it into the box, and click ‘Add’. Restart the terminal (or log in and out) to reload the your ~/.bash_profile . 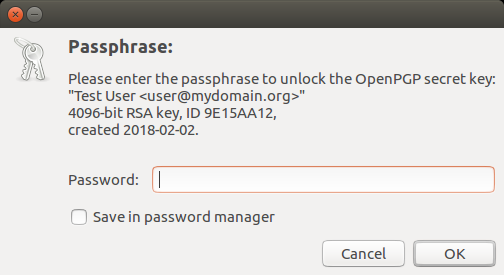 The next time a Git operation makes a call to gpg, it should use your gpg-agent to run a GUI window to ask for your passphrase and give you an option to save your passphrase in the keychain. Change a file and save it with your favorite editor. Add the file and sign the commit with your GPG private key. The option –gpg-sign (-S) uses GPG for signing commits. The option –signoff (-s) adds the Signed-off-by line in the commit message footer. This should result in Git asking you for your pass phrase, if the ssh keys are password protected. The presence of a GPG signature or pushing of a gpg signature isn’t recognized as a “change” by Gerrit, so if you forget to do either, you need to change something about the commit to get Gerrit to accept the patch again. Tweaking the commit message is a good way. Verify the signature of the signed commit locally. A green check next to the users name on the Gerrit change should suggest a valid commit signature.